It's after Christmas, but better late than never. Summary: Crawford gets a glimpse into Schuldig’s idea of volunteer work. Notes: Though it doesn’t come up in the fic, Schuldig sometimes describes Krampus to Americans as being part of “(Heavy) Metal Christmas.” Thanks to marasmine for the beta! Title: "Guilty All the Same"
Summary: It’ll all make sense eventually. Notes: This is based pretty closely on the actual scene in “Mission 24: Zeremonio-- Likenesses Passing,” which had felt off mostly because the creators basically had Schuldig forget he’s a telepath. While pre-reading this fic, red_squared reminded me that explaining this scene was part of a weiss_kreuzmas prompt she asked for in 2013, so... Merry Kreuzmas two years later? Spoilers: “Mission 21: Trane-- Memories” and Verbrechen/Strafe. Summary: One of Yoji’s methods for dealing with his problems is having an impact on his waistline. Notes: “Kummerspeck” actually involves overeating from grief/stress, but this is what came to me, red_squared, so.... Inspired by a request at wk_100’s New Year Drabble exchange, but it went far over the 100-word limit. Summary: Working for Nagi’s organization presents challenges for Schuldig in his current condition. Notes: This is kind of a combination of lauand and indelicateink’s prompts for Indelicateink’s weekend flash challenge. Thanks to Rosaleendhu for the beta. This is my 500th completed fanfic! Summary: There are some things Schuldig won’t do. The weissvsaiyuki battle is open to Weiss Kreuz prompts! 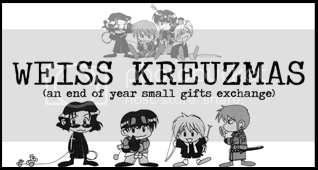 Learn more here and leave your most dreamed-of Weiss Kreuz prompts (anyone can prompt--you don't need to be a battle participant to leave prompts). There is also a feast of incredible delights (drabbles, longer-works, and other goodies) included under this tag. Title: "Under the Cover of Night"
Notes: Spoilers for “Mission 17: Kritiker-- Pride With No Name,” “Mission 21: Trane-- Memories,” “Mission 25: Ende des Weiss-- To the Knights,” “Verbrechen/Strafe,” and the Dramatic Precious CDs. Read-through by Rosaleendhu and Esinde Nayrall. It's Weiss Kreuz fandom vs Saiyuki fandom again in weissvsaiyuki in June and July! Weiss lost to Saiyuki in the last battle, so step up and represent! Full information is available here. Join us--and signal boost! Summary: Crawford and Schuldig's first mission together challenges their freshly formed team, and an unexpected event changes Schuldig's perspective and their relationship – forever. Summary: Smartphones make Schuldig’s work easier and harder, and he’s annoyed about all of it. Spoilers: “Last Mission 11: Piece of Heaven,” “Last Mission 12: Epitaph,” “Mission 22: Miteid -- Final Reconciliation,” and some vague spoilers for the whole Glühen series. Summary: Now that he’s returned to Schwarz, Nagi has plans. Warnings/Content: worksafe, some violence, a bit of light m/m. Notes: This fic was inspired by daegaer's prompt from this year's weiss_kreuzmas bonus round: “Nagi/Schuldig; post-Glühen; they form a new team; any genre.” Read-through by rosaleendhu. If you missed last year's opportunity to show the world your lack of talent but your large amounts of enthusiasm, this is your chance! Draw whatever scene you have always wanted to draw and forget about the quality because we don't want it here! Entries: Every rating, genre, fandom, technic or whatever is allowed and encouraged as long as it looks crappy enough (although I'd rather avoid pics of real people or portraying kids in adult situations, please). Deadline for submission: January 3th. More details, submitting post and provisional exhibition here! Well, 'tis the season and I have noticed that a few of us are missing the witty fan banter we usually enjoy around this time of year. So, if anyone is game... I have had a few fannish questions percolating that may be of interest. Or not. I guess we'll find out! What are your favorite examples of the Weiss boys stretching - or outright shattering - that premise? If we really look at it... does the premise hold up at all? What are your favorite examples of Weiss being outright evil? And the flip side of that... Schwarz are the 'bad guys'... but are they always? Is there nothing redeemable in there? Are there any examples - out of the few - where they could possibly be construed as not-so-bad or even reluctantly 'good'? Weiss Kreuzmas 2013 now open for business! 2013 SIGN-UPS NOW OPEN, CLAIMING BEGINS 10:00PM UTC* ON SATURDAY 27 OCTOBER 2013. *What time is that where you live? Find out here!